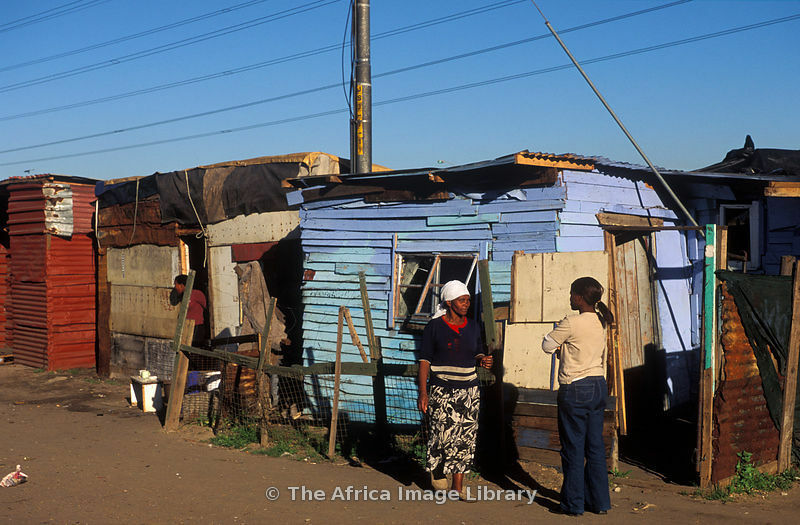 Representations of informal settlements in the work of visual artists are often of interest to architects designing projects in informal settlements. In my last post, I wrote about an artist who focuses solely on the formal qualities, the “skin” of informal settlements, and tried to look at the work through the lens of Ananya Roy’s proposal for a “genealogy” of representation that would somehow reflect the “mapping and unmapping of interests and power,” show the city as a “mundane articulation of production and social reproduction,” and document the constant interpenetration of First and Third World geopolitical axes. In this post, I want to look at the work of Fortune Sitole, a South African artist now living in Oakland, California. 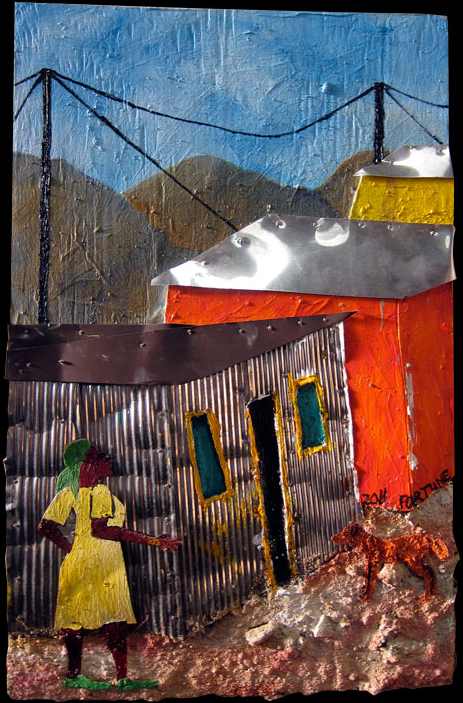 Mr. Sitole makes mixed-media paintings of the Cape Flats, a large area containing many informal settlements outside of Cape Town, South Africa. The rough textures and irregular edges of the pieces accurately evoke the real textures of the built environment, and the human figures represent people engaged in different play and work tasks. But again, as in Mr. Gillette’s work, income-generating activity is rarely depicted. Are the residents of the Cape Flats commuting to jobs in the center city? Are husbands living and working elsewhere and sending money home? What is the tenure status of the communities shown? These and many other questions are raised by the work, but is there a fundamental limitation to how much information and analysis can be contained and communicated in a representational perspective image? Is Ms. Roy’s goal achievable? As Adriana Navarro-Sertich pointed out in a previous post, the methods and materials used to create any representation reflect “particular ways of thinking about society” and support a certain point of view. As I think about the artists’ work I’ve looked at, I have begun to wonder whether there is in fact any workable method for presenting sociological and economic data in a perspective representation. Cartography is so powerful precisely because it does have the capacity to contain and organize this type of data. Architects’ perspective drawings of a proposed project in its context typically don’t address these issues in a meaningful way, but instead are designed to sell the project to the stakeholders. The challenge is how to showcase the quality of the design, but somehow also to find a “middle way” to describe the context. Can we describe the social and economic forces at work without either sugar-coating the informal settlement or making it the dangerous but exciting “other” which the project intends to improve?